I had a case of blog burnout last week. Approximately twice a year I have to take a break from blogging. I love blogging for so many reasons, but I also have kids and a household to run and sometimes they don't blend well together. So a couple of times a year I have to take a step back. It didn't help that the herb garden that I had spent the last two months perfecting was stolen off my porch over the weekend. Sometimes I really do not understand people or what they are thinking. I was more than a little upset. Luckily the farmer's market had all their herb starters on clearance, so I started a new pot. It will take a while though before it resembles the one that was stolen. I am trying to keep my meals simple this week to keep my sanity. Tonight I tried a new recipe for Baked Spaghetti from Taste of Home. This recipe has 10 ingredients. It takes 1 hour 25 minutes of total time, 25 minutes of which is active and makes 10 servings. I did make a few changes to the original recipe. First I used frozen spaghetti that I thawed. I seem to always have leftover pasta, so I freeze it for later use. For the seasoning salt I used Tony's for a bit of spice. Finally, my total cooking time was slightly longer than the original recipe. I allowed the spaghetti to bake for 35 minutes with the foil off in order that it fully browned. Since I can't eat gluten the rest of my family sampled this dish. My kids were huge fans of this recipe. I liked that it was very easy to put together and made enough servings for multiple meals. Plus the servings are very big, so if you cut the pieces smaller you could make it stretch even further. 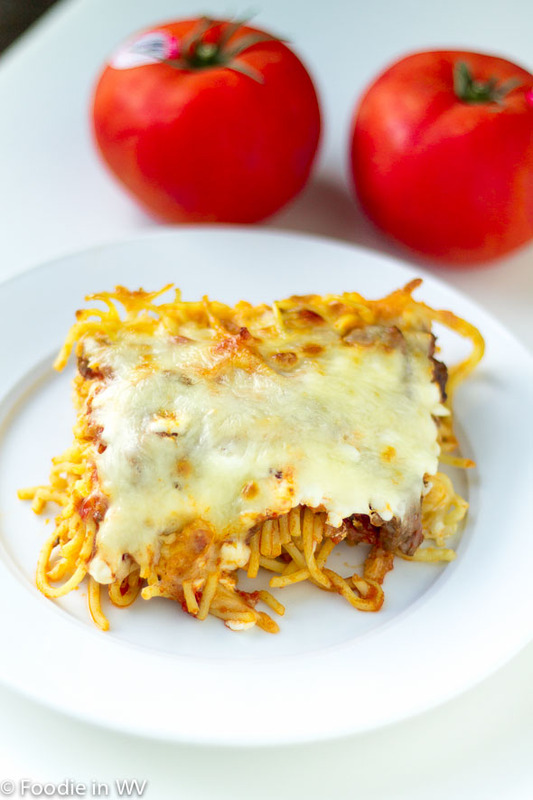 For the recipe go to Baked Spaghetti. Thanks for the award :) I really do appreciate it! I hear ya about the burnout. I get like that, too, but thankfully my hours at work have been slim to none, so I've had time to keep up. Can I just tell you that this looks AMAZING! Yum and Yum! Take it easy, burnout is real for us superwomen-in-training, I'm so glad you afforded yourself a break. Also, as one who is currently working to grow an herb garden, I'm pretty annoyed for you that someone had the nerve to steal yours. Hang in there. Thanks for the sweet comments :) Luckily my new herb garden seems to be doing well! We love spaghetti in our house and we always have leftovers. Baked is a way I've been wanting to try. Thanks so much for sharing this! Yummy! I used to make this all the time and then just sort of forgot about it. Now I will be making this next chance I get! Sorry to hear about the herb garden theft. Sometimes I don't understand people either. Good for you for not losing hope and starting a new one. Good luck! I try to not let one bad experience ruin things for me. I love gardening so I just decided to start a new pot. So far it is doing really well! We missed you! How dare they steal off your porch. The nerve of some people. I've personally never tried fried sphagetti but this looks delicious. Thank you as always for sharing your delicious recipes with us. Thanks :) Our city is a college town so sometimes people just don't know any better (at least that's what I hope!). The recipe looks good. You're brave to make something so delicious looking that you're not going to sample. :) It does look like a good one. I had leftovers of a gluten free pasta dish, so it worked out for me too :) I agree that breaks are a good way to get refreshed! That looks really good. I love the idea of baking the spaghetti for a change. It looks like it gives it a little crunch. It does have a really nice crust! Ann, why don't you line up a couple of guest post and take the week off. Don't worry about the comment or commenting back and tell everyone you would be back in 10 days. That's mostly what I did for the last week or so. I only started posting again a couple of days ago. I finished all the paid posts that I needed to complete and then took it easy :) Summer is always a little nuts since my oldest is home from school. My two boys together can be a little nerve wracking! This spaghetti dish looks awesome. I have never tried baked spaghetti before. I will have to try this recipe. It is too bad that someone took your herbs. So nice to be able to grow your own. Do take it easy. You have a wonderful blog so nothing to worry about. OMG you are trying to kill me while I am dieting! This looks so good. Can't believe someone stole your herb garden. There are a lot of people with questionable values :) I have a new one started, which will hopefully be just as good! I bet my husband and son would like this. I am not eating much in the way of carbs so I am going to have to pass! We live in a nice neighborhood, but other parts of our city have struggled with a bad economy and not a lot of jobs. This region of appalachia is one of the poorest parts of the US. I try not to judge the person who stole it too much and hope that they used it to cook with and not just turned around and sold it :) I can't wait to hear how the recipe turns out! Comfort food indeed! This looks so delicious. So sorry to hear about what happened...ugh, that terrible. Found your site through Foodie Friday and am now following. Thanks :) I love pasta as comfort food, it's perfect! Going over to check out your site!